Like many boys, Roderick Romero was really into building tree forts when he was six. Several decades passed, however, before the lead singer of the band Sky Cries Mary, now 40, discovered in tree house building a passion akin to playing music. Invited to participate in an outdoor art show in a forest near Olympia, Washington, Romero envisioned – and built – a suspended nest. Then his brother commissioned a deluxe model with an ISDN line, and for his third project, in 2001, the Jivamukti yoga enthusiast found himself in an oak tree in Tuscany, building a leafy temple for Sting and Trudie Styler. 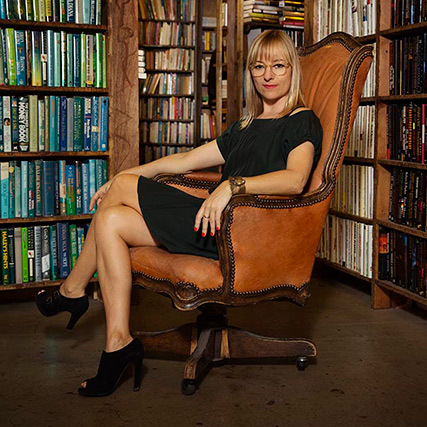 Romero’s wife and band mate Anisa is also a trained interior architect who creates autocad blueprints from the fantastical designs he sketches in a large, leather-bound book. Other projects include two airy dwellings for Donna Karan’s grandchildren; he just completed a West Village perch in a giant leaf maple for the actress Julianne Moore and her family. For these boys, whose greatest dream is to get on a boat to Europe – a journey which now requires a visa since the formation of the European Union – Romero designed a tree house shaped like a ship, with a bow and a stern and a plank to walk. The chosen setting was a huge 200-year-old ficus; their tattooed, twin-braided teacher christened the vessel the Black Fig, like a pirate ship. “They really loved that,” he said. Most of them couldn’t believe their luck. 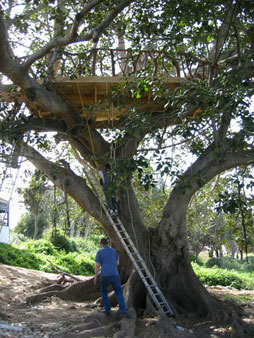 “Are we really going to keep working on this tree house?” they asked. Romero, a Jivamukti-certified yoga teacher, also introduced his students to sun salutations and chanting – partly so he could get his practice in, but also to focus the boys and teach them about connecting movement with the breath. Some were natural yogis; others goofed off. “They thought the oms sounded like a motorcycle,” he said with a laugh. Tree pose, of course, was a big hit across the board. Over the course of two weeks Romero and his team laid out the 18 steps of professional tree house building, from meeting a client to going to the hardware store to inserting the steel beams that will allow a tree to keep growing. Each child was left with a “Diplome d’Honneur” from the Tangier Treehouse Workshop and a new sense of possibility. Today the boys of Darna are still “eating and sleeping and dreaming tree houses” – and from the bow of the Black Fig, they’ve even got a clear view of Spain.